To celebrate its growing and diverse student population, and in carrying out Grand Erie’s goal of Success for Every Student, Caledonia Centennial Public School focuses many of its efforts on Equity. Working alongside teaching and support staff, a few key members of the Grand Erie team with unique roles at the Board level help ensure the school promotes practices that mean students and their families feel safe, welcomed and included each and every day. 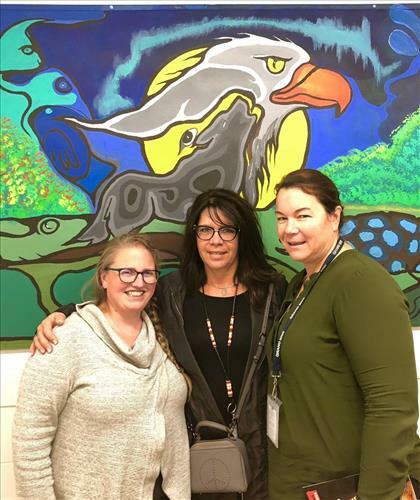 The school benefits greatly from the support of Suzie Miller, Johanna Gordon, and Marcie McGeein, who each bring a specialized set of skills and expertise to help students thrive. Suzie Miller is an Instructional Coach, Indigenous Focus, for Grand Erie. She shares Indigenous perspectives and teachings that enhance the understanding of learners and staff alike. One of the ways she does this is through the introduction of the Wampum belt to guide activities and aid storytelling. Miller has students gather in a circle to create a safe, inclusive space where each voice is respected – an activity well practiced in Indigenous teaching, and one that parallels the Equity foundation of the Multi-Year Plan. Johanna Gordon, Instructional Coach, takes Suzie’s teachings of honouring the voices and perspectives of others, and applies them to math lessons. Gordon employs Number Talks, short exercises that help build numeracy skills, giving students a better sense of problem solving. Rounding out the trio of support is Marcie McGeein, English Language Learner Itinerant Teacher. McGeein uses her expertise working with English language learners to help them acquire reading, writing, and speaking skills. She does it in a way that also builds in the opportunity for learners to share more about themselves. Honouring each students’ contributions, and facilitating opportunities for sharing more of the cultures they come from, provides a powerful platform of exchange that means everyone thrives. Caledonia Centennial recognizes Respect as a key character attribute, and celebrated this at a recent assembling by honouring students whose actions have gone above and beyond in terms of building this culture of belonging at Caledonia Centennial.